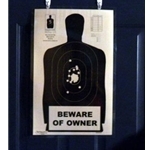 Security signs are a must for personal or business property. 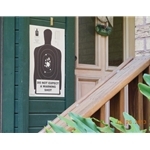 These Security Silhouette signs are a replication of NRA 25 yard target with the exception of 50 bullet holes and the message. 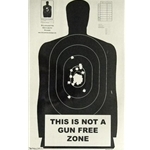 The signs are actual size of a silhouette target which is approximately 15″ X 24″. 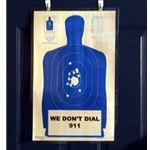 The signs are available in 4 different colors and 5 different warning or messages. One of the security sillhouette signs are blank so you can write your own message with a felt tip marker, allowing you to change the message as often as you please. Because these signs are laminated on both sides, they are weatherproof. 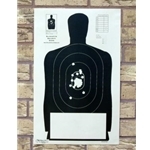 There are 2 holes on top of each silhouette for a secure mount to any wall. You can attach to the wall or door of your choice with staples, tacks, nails, anchors, glue, glue dots, silicone or construction adhesive.